Fairbanks is Alaska's second largest city and the largest in its interior region. Fairbanks developed as a city in the early 1900s when an Italian prospector struck gold in the area. It continues to live off the gold nearby, mined by the Fort Knox Gold Mine, the largest in Alaska. Tourism has also developed as a major industry, as the city has developed as the hub of Alaska's interior. The city is home to the University of Alaska Fairbanks, the state's oldest college. University of Alaska Museum of the North - 15 May-15 Sep 9AM-7PM with shorter hours during the rest of the year. An excellent collection of exhibits about the nature, history and cultures of Alaska; the displays on the Northern Lights are particularly trippy. $5, $3 for youths age 7 - 17, children 6 and under are free. Creamer's Field Migratory Waterfowl Refuge - Located in the northern part of town off of College Road, Creamer's Field Wildlife Refuge is a former dairy that is now a migratory stopover point for countless numbers of Canada geese, sandhill cranes, ducks, and other bird species. Numerous trails lead through the refuge and there is a visitor center located within the old farmhouse. Pioneer Park is an historic themed park. Aurora Borealis, or Northern Lights, can be observed during from about September until the beginning of April. Winter sports like cross-country skiing, snowmobiling, dog mushing and ice fishing. Fairbanks Golden Days is usually held towards the end of July. The Rubber Duckie Race, held just after the Golden Days, sees 6,000 rubber ducks race down the Chena River. The Tanana Valley Sandhill Crane Festival is held in August. The Midnight Sun Festival celebrates the longest day of the year; Midnight Sun Baseball Game is played at 10:30 pm without any artificial lighting. The World Ice Art Championships sees competitors from around the world show off their ice carving skills. Held in March. The World Eskimo-Indian Olympics in July. The Festival of Native Arts in March runs for three days, featuring traditional Alaska Native singing, dancing and crafts displays. Fairbanks' short summers last from late May to early September with temperatures mostly around 20 °C or a little higher, but occasionally hitting well over 30 °C (record is 37 °C. Nights are around 10 °C around this time. Winters last from December to March with average daytime temperatures around -15 °C while nights are between -25 °C and -30 °C although below -50 °C has been recorded. Most of the rain falls during the warmer summer months, while winters see an average of about 175 centimetres of snow. There are regular direct flights to Fairbanks International Airport from Anchorage and Barrow and seasonally there are also direct flights from Minneapolis-Saint Paul, Salt Lake City, Denver, Dawson City, and Seattle. Daily jet service is available from a few US cities and there are scheduled or charter service to Europe and Asia. Japan Airlines offers seasonal flights to Fukuoka, Nagoya and Tokyo, and Frankfurt-based Condor Airlines offers weekly direct flights during summer. Several small airlines serve tiny settlements in the arctic. In the summer months, Princess Tours runs a service between Fairbanks and Anchorage called the Denali Star Train. The trip takes roughly 12 hours and passes through the Denali National Park. Rates vary seasonally, ranging from $155 one-way in the shoulder seasons to $194 in the peak season. The Alaska Railroad connects Fairbanks also to Whittier and Seward, pas Anchorage. Alaska Salmon Bake, 2300 Airport Way (at Pioneer Park). Summer only, 5PM-9:30PM, seven nights a week. Alaska Salmon Bake is the mother of all cheesy tourist stops and is heavily trafficked by tour buses filled with foreigners and senior citizens, but for the hungry budget traveler the salmon bake probably provides the best value in Fairbanks. This all-you-can-eat smorgasbord of grilled salmon, cod, prime rib, lemonade, and blueberry dessert can be had for $36 per person (2018 price), which by Alaska standards is a bargain. Ivory Jacks, 2581 Goldstream Rd, ☎ +1 907-455-6665. Ivory Jacks offers casual meals to fine dining. Located just north of town in Goldstream Valley. There is an open mic every Saturday at 10PM where performers get to take a free CD home of their performance. Lane's Quickie Tacos, 3412 College Rd #1, Fairbanks (Upstairs from the Marlin), ☎ +1 907 378-2812. Run by two friendly guys, they serve a simple menu of four different types of tacos and a special fifth one that frequently changes. Very good food. Casual, basic accommodations. One traditional Fairbanks cruise is known as "The Bar Float". The Chena river runs right through the center of town, with several of the bars that may be accessed right from the river. You can start at the put in near Pioneer Park, where Peger Road crosses the Chena River. There, they also rent canoes and kayaks. 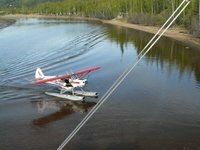 From here, you can float downriver past the bars known as The Boatel, Chena's, Pikes Landing, and finally taking out at The Pumphouse. Lavelle's Taphouse, 414 2nd Ave (Look for the large Elbow Room sign on 2nd. Lavelle's is next door. ), ☎ +1 907-888-2220. 3pm-11pm most days. For the beer geek, Lavelle's is a please place to be, with 36 rotating taps, including wine and cider. This bar doesn't serve food, but frequently has food trucks outside in the summer, and outside food is welcome. It caters to a diverse crowd. Gables Inn & Suites, 4312 Birch Ln, ☎ +1 907 479-0751. 9th Ave Hostel, 905 9th Ave, ☎ +1 907 458-0095. Close to Downtown Fairbanks. Dorm beds and tent space available. Free WiFi, computer terminals, coffee, and bicycle rentals. $30. Billies Hostel, 2895 Mack Blvd, ☎ +1 907 479-2034. Clean, spacious and friendly. Only downside is the distance from the center of town. Close to the rail and airport though. Good Internet access with free wireless and a few desktops scattered about. Each bed is assigned a daily chore. $30. We have a comprehensive list of accommodation in Fairbanks searchable right here on Travellerspoint. You can use our map to quickly compare budget, mid-range or top of the range accommodation in Fairbanks and areas nearby. This is version 28. Last edited at 16:25 on Feb 27, 19 by bigleap.abg. 10 articles link to this page.